The popularity of Pattaya beach comes from a crescent and long sandy bay with a full of sport activities, shopping malls, street markets, a wide range of Pattaya hotels and resorts around the beach, high quality seafood restaurants, and definitely pubs and bars. In other word, the beach can response to any tourist needs, including shopping in pattaya where there are the major shopping centers located near the beach as Central Festival Pattaya Beach, Mike Shopping Mall, and Royal Garden Plaza. Apart from the beach shopping centers, visitors can also enjoy street stalls along the beach and there are a variety of shops in Pattaya Walking Street which is located near Pattaya Beach as well. The term Pattaya Beach usually covers Naklua Beach and Jomtien Beach, but keep in mind that the facilities and options there are not fully provided to visitors as the beach at city of Pattaya. Pattaya beach these days is clean because for few years Pattaya city targets to clean-up the beach for attracting more tourists and for raising the reputation of the beach. After cleaning action, Pattaya water sports, such as slippery banana boat, wind surfing, and jet skiing, have constantly increased. Off-shore activities and sightseeing are also departed from Pattaya beach. However, in the case that visitors would just like to have a break with comfortable at the beach rather than have sunbathing, there are beach chairs under umbrellas for hire with a little money everywhere. 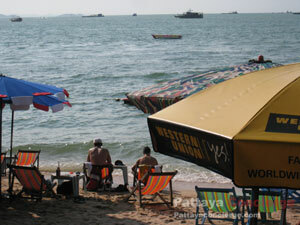 At the day time, foreigners usually go to sunbathe at the beach, while Thais prefer not to do the same as expats. This is because Thai People prefer to have a white skin than a tan. So, don’t be frustrated if you don’t or rarely see them sunbathing. At the evening, joggings through the beach can be seen time to time. Also, it would be nice to know that there are small groups of visitors or local people exchanging their experiences at the rest place that locates at the Beach Road connecting to Pattaya Central Road. On the other hand, visitors who enjoy beers and night entertainments will prefer the beach at South Pattaya, where there is a dense concentration of pubs and discos. Attractions around the Pattaya beach are also key point making the beach so popular because visitors can enjoy the beach and interesting sightseeing in a day trip. “Ripley’s Believe it or not", located in Royal Garden next to Pattaya Beach, is an interesting choice for family because it could amaze both parents and children. Another good view point next to the beach is on top of Wat Khao Phra Bat (Pattaya Hill), which offers not only a panoramic vision of Pattaya bay area, but also a sacred Buddha image. Suan Chaloemphrakiat, or AKA fitness park, and Wat Phra Yai, also locate near the area of the Phratamnak Hill. Suan Chaloemphrakiat offers such a large garden that visitors usually come to jogging or take a rest, whereas Wat Phra Yai is a place that visitors come to see the biggest Buddha image – Phra Phuttha Sukothai Walaichonlatham. 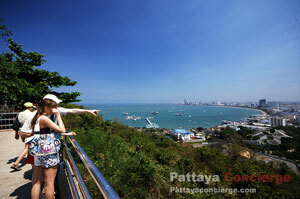 In fact, there are still more attractions in Pattaya, but they are not near the beach. Pattaya Beach Road connecting to North Pattaya Road is the mark of Ending Pattaya Bay, where dolphin roundabout is situated. From the dolphin roundabout to the north side is called Naklua. Because Naklua is much slower developed than Pattaya City, Beach on Naklua part is still quiet and still contains traditional environments, so it would be suitable for visitors who are looking for enjoying a non-busy beach. Wong Amat Beach is the most well known beach on Naklua part. The beach is approximately 2 km long. However, visitors need to keep in mind that facilities at the any quiet places, including Beach in Naklua, are not as much as a crowded place. So, visitors would need to walk for a while to find a good convenient store. The Sabctuary of Truth is one of Pattaya attractions that is located in Naklua part, so Naklua is also a popular place to stay, in particular for families.